Navigate to the “Miscellaneous” drop-down menu and then click on “System Options > 4 – Payment Options”. From here click on the “Advanced Receipt Options”. Once in the Receipt options menu check the box at the top to “Enable emailed receipts” and then click the “Setup Email” button. 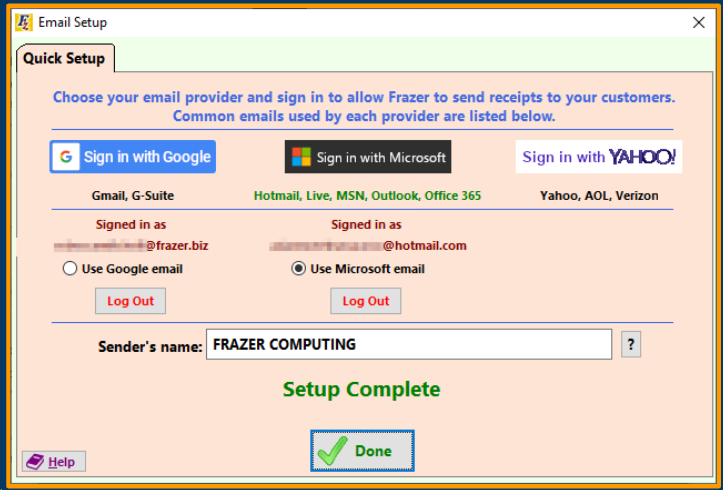 If you are using an email provider listed, you can select the appropriate button and then follow the steps to enter your credentials as well as (in some cases) give the Frazer program access to you email account. If you are not sure who your email is provided by then you can enter your email in the box below and select “Autodetect Provider”. If your provider is not one of the quick links above then Click here to read about manual email setup. Once you see a green “Setup Complete” message, you can click “Done” and then “Save” and you should be ready to email receipts. 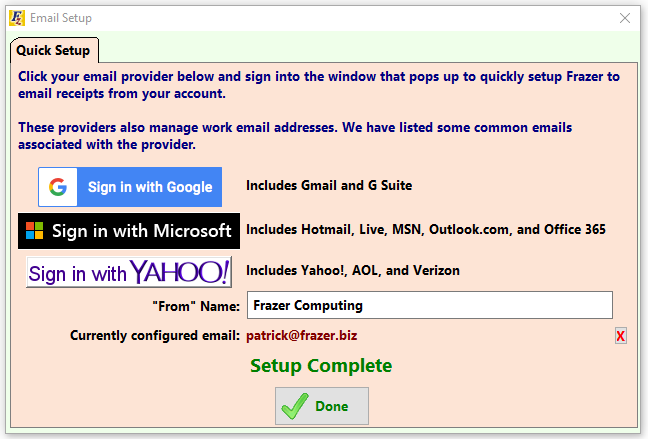 After set up you will receive a test email in your email account. If you have received this, then you are set up and ready to go! 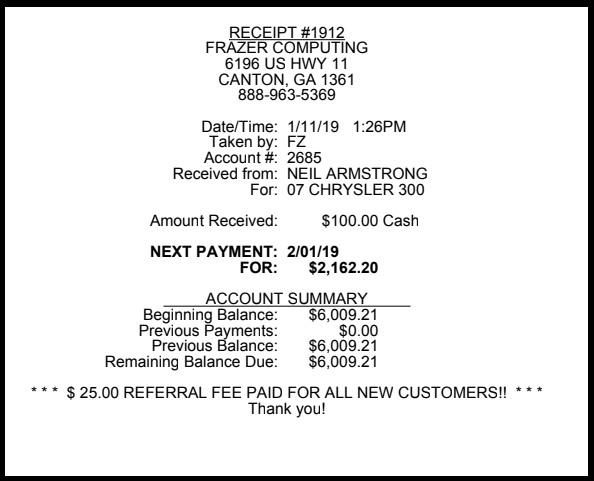 Once you have gotten your email setup, Frazer will prompt you to print, email, and print or email receipts whenever you take a payment in Customer Activity. 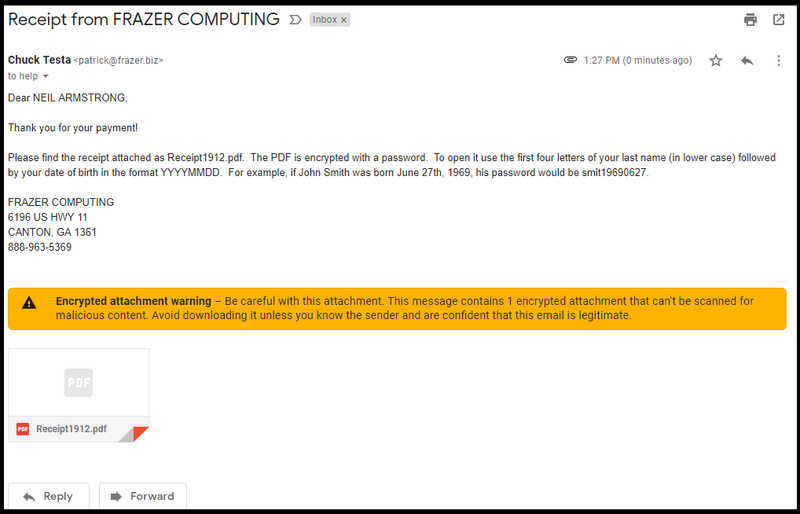 Advanced Receipts will send an encrypted PDF document that a user can access via email. The body of the email will contain “clues” for what the password is to access the receipt. This makes the receipt compliant and not easily accessed by those who should not have balance and customer information. Once the password is entered your customer will be able to access the PDF receipt. The emailed receipt will look exactly what a customer could expect if they received the receipt by hand.